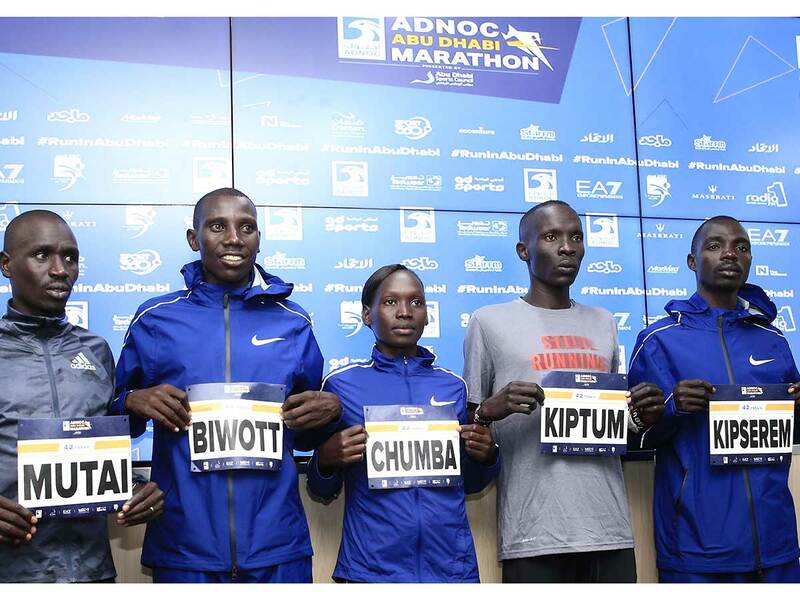 Abu Dhabi: Fresh after becoming the new world half-marathon record holder with his win at Valencia, Kenya’s Abraham Kiptum is confident that he can go on to clinch the inaugural Adnoc Abu Dhabi Marathon to be held in the capital on Friday. Speaking to Gulf News ahead of the race, Kiptum said he is in the best of shape and is ready to give everything to claim the top honours. “I’m delighted to come here for this race and very much ready,” he said. “Me being the half-marathon world record holder and being in the shape I’m in, I feel I will be able to finish here with my personal best. Kiptum’s half marathon record stands at 58:18 — smashing the time of Kiptum Eritrea’s Zersenay Tadese in 2010 — and he has also won the Daegu Marathon this year, clocking 2:06.29. Rotterdam 2016 marathon winner Marius Kipserem was also upbeat about doing well here despite this being his first visit to the capital. “I trained well,” he said. “I haven’t seen the course and haven’t seen Abu Dhabi except being in the airport when on transit. Kenya’s Stanley Biwott, who won the New York City Marathon, will be another athlete to watch out for. Having finished second twice in Dubai, he is hungrier than ever to clinch the title. Eunice Chumba Chebichii of Bahrain will join the fray of the Elite Women, and will be up against Ethiopia star Gelete Burka. Though it is going to be a stiff challenge for Chumba, she was pretty confident of a good show. “I’m well prepared for this marathon,” said Chumba, who won silver in the 10,000m at the Asian Games in Jakarta in August. “It’s the first marathon in Abu Dhabi and looking forward to it. My last race was in Beijing in September where I finished second and I have been training since then for Abu Dhabi. Chumba also felt that the course is flat and hence fans can expect some fast times. “Yes, it’s possible, if not a personal best time around 2:20 or 2:21. That’s what I would be aiming at in this race, and hopefully, I can achieve it,” she added.